Star-Bulletin distributor Albert Tanoura closes the door on his van as he prepares for his deliveries. THE HONOLULU STAR-BULLETIN is the smaller of Honolulu's rival daily papers, and "we're always going to be smaller," said Publisher Dennis Francis. Officials at the papers use different language in discussing their distribution success. The Advertiser uses the word circulation, while the Star-Bulletin refers to readership and reach. Circulation is the number of copies distributed, while readership can reflect one person buying the paper and sharing it with many others. It can also refer to people who read the paper online for free. It used to be that the circulation of both papers was measured by the Audit Bureau of Circulations, which can be likened to Nielsen ratings for television and Arbitron ratings for radio. The Star-Bulletin withdrew from ABC audits in 2002 in a dispute over rules governing paid circulation. "If you really peel back the onion, where their circulation is, they're not that much bigger than us." To illustrate its readership and reach to advertising clients, the Star-Bulletin purchases independent market research conducted annually by SMS Hawaii. The company's research is also used by many advertising agencies, media and other companies. The Advertiser, Francis said, uses mainland-based Scarborough Research, which he says uses a "much smaller sample size." In March 2001 the last audit of the two papers during the JOA showed the daily Star-Bulletin at 58,401, the daily Advertiser at 101,628 and the combined Sunday edition at 173,405. Six weeks after the split, the Advertiser commissioned a special ABC audit to reflect its new numbers. It showed that the Advertiser's circulation had jumped to 168,000 from 105,000. The Advertiser had started a p.m. edition when the JOA split, and "boosted circulation overnight," said Francis, who joined the Star-Bulletin after a long career at the Advertiser. The Advertiser's president and publisher, Mike Fisch, did not return repeated phone calls over the period of a week for this story. Despite a preliminary ABC report last September showing the Advertiser's average Monday-Friday circulation at 140,000, Francis said, "If you really peel back the onion, where their circulation is, they're not that much bigger than us." "Once you consider the total circulation counted on the neighbor islands, school copies, hotel copies, the forced buy of Friday and Saturday to what was previously Sunday-only subscriptions and the 22,000 copies eliminated from the discontinued p.m. edition, they are considerably less than the 140,000 they are currently claiming," Francis said. "Additionally, the 22,000 former p.m. customers were automatically switched to the morning edition," he said. "However, that reader group has been forced twice to receive the new p.m. edition for free along with their paid Sunday-only subscription and then again when the p.m. edition was discontinued and they automatically received the a.m. edition." "It remains to be seen how much of that will eventually stick," Francis said. 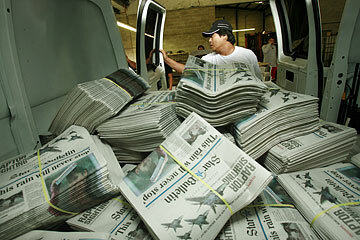 Readership at the Honolulu Star-Bulletin, MidWeek and the Honolulu Advertiser increased in 2005 from 2004. Here are the total number of readers and the percentage increase for each publication.